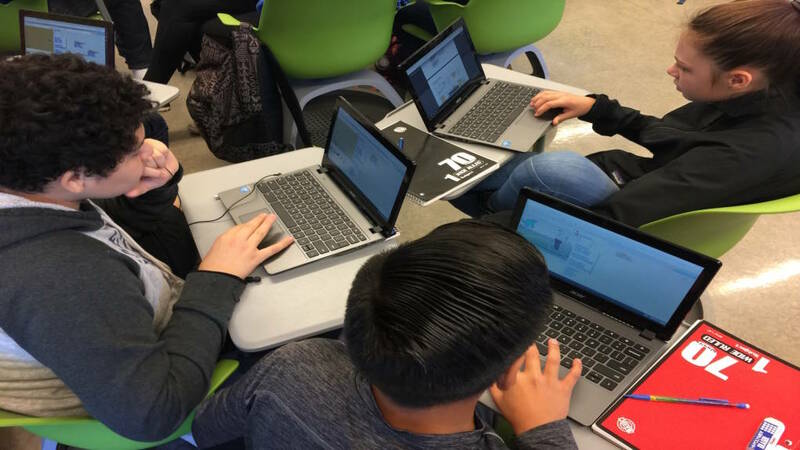 Many teachers and students on our middle school campus rely on free resources from Scratch.mit.edu, a site developed by the Lifelong Kindergarten Group at the MIT Media Lab, to introduce students to coding and engage them in creative projects. 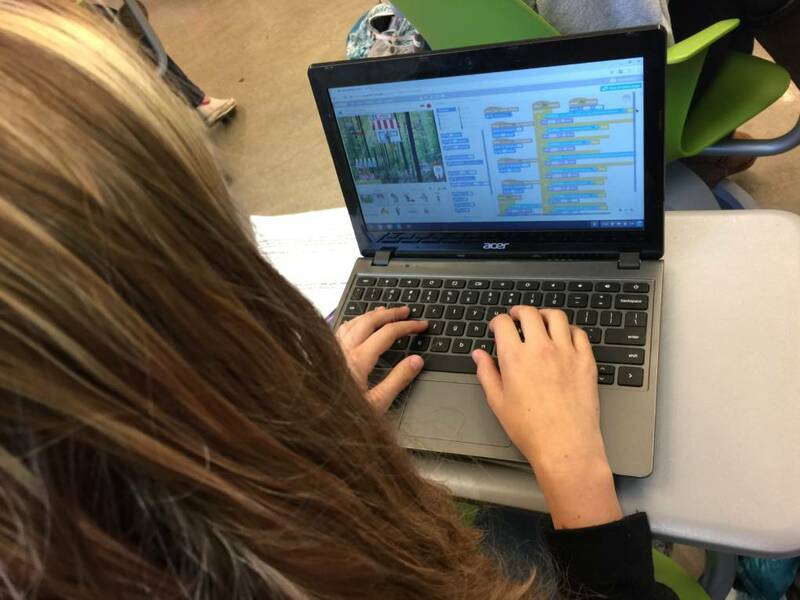 Some of our teachers include Scratch in their annual Hour of Code offerings; two teachers offer Scratch coding as part of their Design Lab classes; students in my English classes further their study of narrative by designing and coding Scratch games; another teacher uses Scratch in his Robotics and Engineering class; our librarian hosts a coding club in the library; and many of our students continue to build their coding skills with Scratch on their own. 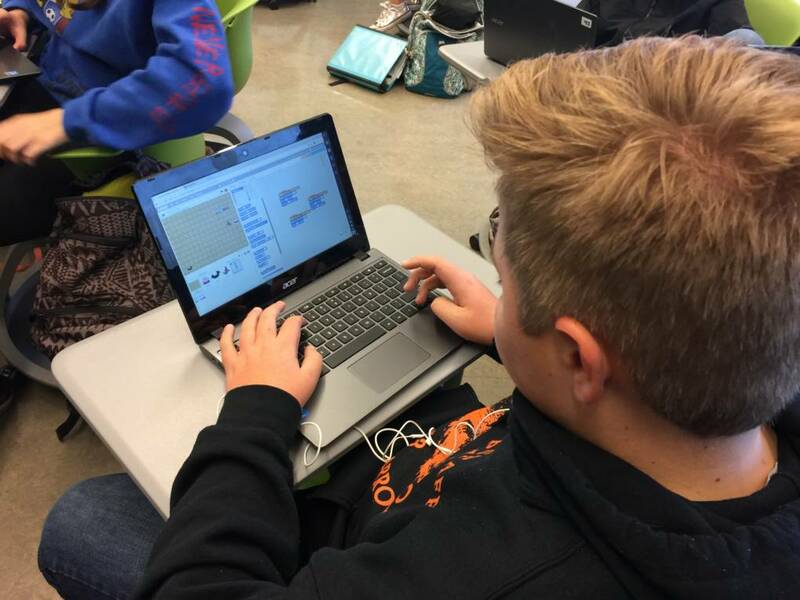 On any given day, one can expect to see some of our students working on Scratch coding projects. In addition to being a 1:1 iPad school where technology is integrated in many content areas, we have also been teaching digital citizenship through a campus-wide approach for a few years. Our teachers use lessons from Common Sense Media, as well as work together to develop lessons of our own. We also take advantage of the many digital citizenship PSAs on YouTube to encourage our students to work and play safely and responsibly in online spaces. Imagine my surprise, then, when a Design Lab student logging into his Scratch account called out, “Hey! What happened? My account’s been banned!” I assumed it was an error on his part. After years of working with middle school students and technology, I know that, “It won’t let me log in,” often means, “I forgot my password.” But then the student said, “Our whole school has been banned! It’s our I.P. address!” Now we’re talking serious business. A temporarily banned account can happen when a user violates a term of use, but a banned I.P. address means many of our students must have been seriously inappropriate on the site. This called for an investigation and prompt action. I exchanged some frantic emails with a few other teachers who were currently using Scratch, and we decided to start by contacting Scratch to get as much information from them as possible, such as student names and how the Community Guidelines were violated. Scratch replied within days and provided us with a list of usernames, email addresses, and the messages that each student had received, explaining why their account had been blocked. We were shocked and disappointed to see that four of our students had repeatedly received messages from Scratch about their inappropriate usernames, disrespectful behavior towards other community members, and their attempts to create new accounts to work around a blocked account. Initially we thought some of the students might have violated some guidelines because they hadn’t read them, but now we could see that they continued to behave inappropriately even after being warned by Scratch. Our administration joined us to meet with parents and students to explain the consequences for this behavior (one day of on-site-suspension, as directed by our district discipline policy), and to ask each student to write a letter of apology to Scratch. We wanted them to understand that they had violated the trust of the online community, and that they owed this community a heartfelt response. Next on our agenda: how can we better teach our students to be responsible digital citizens? We were already actively teaching digital citizenship in our classes, but with a middle school population of nearly 1000 students on a campus where online work was encouraged, we had learned the hard way that we can’t possibly monitor them all. Start every school year with campus-wide lessons that align with digital citizenship standards, such as these from ISTE (International Society for Technology in Education), or from the AASL (American Association of School Librarians). This Common Sense Media chart aligns both the ISTE and AASL standards with the Common Core Standards. Include examples of actual online community expectations in these lessons. Scratch’s Community Guidelines, the Young Writers Progam Codes of Conduct, and KQED Learn’s Code of Conduct are all kid-friendly examples of how we want students to behave online. Review these expectations every time students join and work in an online community. Go beyond stand-alone lessons and incoporate digital citizenship into the work students do across the curriculum. These projects can deepen the learning in social studies, science, math and English while also developing strong citizenship skills. But before our students leave their first online footprint, we need to ask some tough questions about our face-to-face relationships. Is our school itself a community that models good citizenship? Are we teaching (and modeling) empathy alongside our academic and digital lessons? Do we have clear expectations for how our students should treat each other in our classrooms and on the yard? Do the adults model respectful and caring community behavior? When teaching students how to behave in online communities, it would make so much more sense if we could connect those online expectations to our own face-to-face relationships. Since most online communities encourage feedback and dialogue, our students need to first learn how to do so in person. Do we teach them how to disagree respectfully? Or to offer kind and constructive feedback? Does empathy drive our students’ design thinking? If we don’t teach empathy and respect in our classroom communities, how can we expect students to practice them online? Laura Bradley has been teaching middle school English in Sonoma County, California since 1988. She also developed curriculum for and teaches a digital design class and a broadcast media class, where her students produce the school’s daily news show. Laura holds an M.A. in Educational Technology, and is a Google Certified Innovator, Google Certified Educator, PBS Digital Innovator, National Board Certified Teacher, Bay Area Writing Project Teacher Consultant, Edutopia facilitator, and first place winner of the Henry Ford Teacher Innovator Award. Prev Updated Southern California Wildfire Maps Next What Will the Internet Look Like Without Net Neutrality?